Controlling a light with the Infrared Remote Control Switch. The SunFounder (left) and SainSmart (right) solid-state relay boards. They both use the same Omron solid-state switches, type 1565E, rated at 240VAC, 2A. The load voltage is specified at 75 to 265VAC, 50/60Hz, and the load current is 0.1A to 2A. As you can see from my photograph they are both quite sloppily assembled, but they are fairly inexpensive; under $20 or £13. The SunFounder solid state relay board is the slightly smaller of the two, and has the advantage of offering both screw terminals and header pins for the low-voltage signals. The SainSmart board is slightly larger, and only provides screw terminals for the low-voltage signals. Both boards draw a maximum of about 32mA at 5V DC, and each input switches on at about 1.55V with a current of less than 0.5mA, so you can drive them directly from the output of an AVR. WARNING: On both boards there is live AC power on some of the tracks to the solid-state switches on the bottom of the board, so take care when testing with AC power. I decided to base my project on the SunFounder board, because of its smaller size and the convenience of the header-pin connections. Circuit of the Infrared Remote Control Switch. 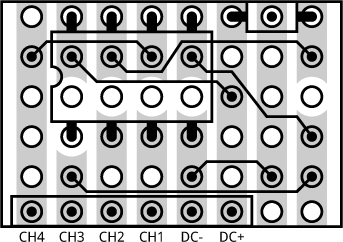 The infrared control circuit built on a small piece of veroboard. The program is a modified version of my IR Remote Control Receiver project. I compiled the program using the Arduino-Tiny core extension to the Arduino IDE . Select the ATtiny85 @ 1 MHz (internal oscillator; BOD disabled) option on the Board submenu; this is the default configuration of the ATtiny85 fuses. 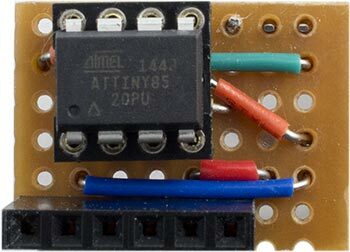 I uploaded the program by inserting the ATtiny85 into the socket on Sparkfun's Tiny AVR Programmer . 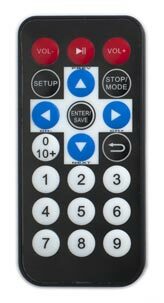 Here's the whole IR Remote Control Switch program: IR Remote Control Switch Program.